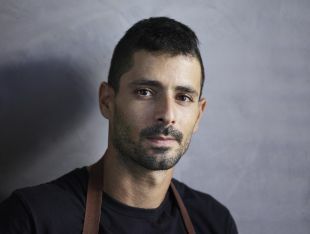 Yehi Zino is one of the few Israelis to have truly mastered the secrets of the Mediterranean, and his skills are on display daily at the Pescado fish restaurant in Ashdod. Four recipes for the holidays from one of Israel’s most talented young chefs. 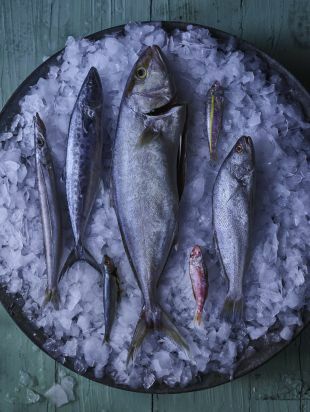 Good fish restaurants rise and fall on the quality of their ingredients. In 2009, it was still possible to eat well at Pescado, but it’s hard to compare the meals back then to what this young and talented chef serves up today. In addition to his great talent, Zino also possesses boundless curiosity about flavors and ingredients, and a keen thirst for knowledge. The basic menu, like the design of the restaurant, is minimalist: white ikra, spicy tomato salad, several Asian-inspired raw fish dishes, and four or five fish dishes based primarily on the selection available from imports and fish farms (sea bream, sea bass, salmon and meagre). Then there’s the daily selection of locally caught fish, depending on what the sea and local fishermen can provide (even Zino, one of the few chefs who keeps a careful daily record of the fish being brought to the market, admits that in the modern age and with the current fishing situation, it’s hard to define any clear seasonality). The dishes on the menu, either Asian- or Mediterranean-inspired, appear simple, with the flavor of the main ingredient front and center, and the type of fish dictating the cooking method. But they are also very elegant dishes and their originality shines through. After years of study (and trial and error), Zino is one of the few people who has mastered the secrets of the Mediterranean. Word of this excellent fish restaurant located on the Ashdod shore — and unfortunately, even in a country that sits along the Mediterranean coast, there are not many of this caliber — has spread and the place is almost always packed. Even on a Sunday afternoon, a time when most Israeli restaurants are at best half-full, Pescado is bustling. Besides the many locals who have made this pleasant, southern Israeli restaurant their second home, lots of people (including us) travel from further afield just to eat Zino’s fish. Place all the ingredients in a pot and simmer over the lowest flame for 40 minutes. Make sure the oil doesn’t start to bubble, since the paprika burns easily. Remove from the fire and let cool. Blend the contents of the pot using an immersion blender or food processor and then filter through a piece of cheesecloth. The seasoned oil keeps well and becomes even tastier after a few days. This traditional dish, a skillet filled with fish in a hot tomato and pepper sauce in which to dip thick slices of bread, does not appear on the restaurant’s menu. But Zino sometimes makes it for groups of regular customers who come and sit in the restaurant every day, and it is simply superb. The degree of spiciness can be adjusted as desired. a fish weighing 6-8 kg. Salt the fish well on both sides with fine salt. Heat a little of the oil in a wide pot and fry the garlic until golden. Add the peppers and tomatoes and fry for 4-5 minutes. Add the water and the fish slices and bring to a boil. Add the rest of the oil, cover the pot, lower the flame and simmer over a low fire for about 15 minutes, until all the fish is cooked. Remove from the fire and sprinkle cilantro leaves on top. Can be made with sea bream, meagre, red snapper or mullet. 1 sea bream, weighing 1 kg. Preheat the oven to 250 degrees Celsius (482 degrees Fahrenheit). Heat a cast-iron skillet, slice the shallots width-wise, sear them in the skillet and then set them aside. Place the scallions and white wine in an ovenproof pan and cook over a direct flame. Cut a cross-hatching pattern in the thick parts of the fish, and salt the fish well with fine salt. 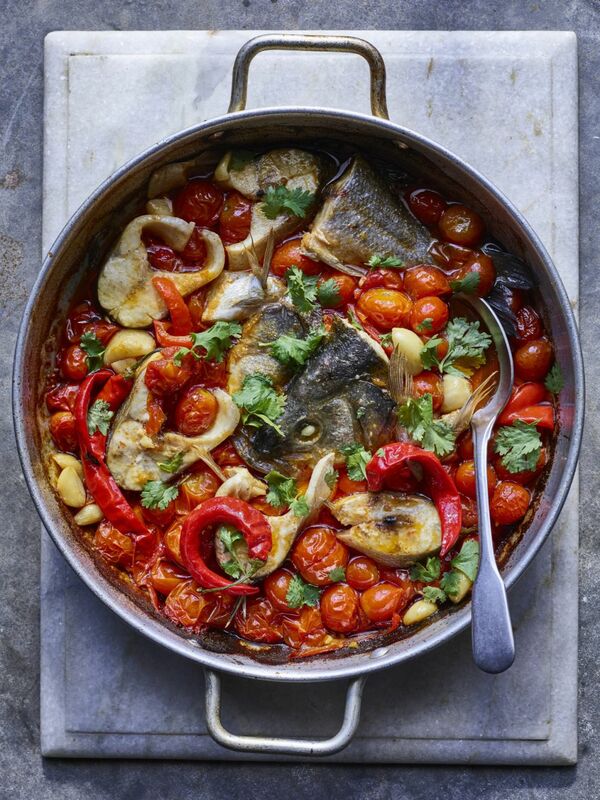 Place the fish in the pan and arrange the shallots, cherry tomatoes, peppers and tarragon on top. Season with coarse salt, dried chili and black pepper. Cut the tomatoes in half, squeeze them over the fish and vegetables, and then add to the pan. Put the pan on the stove and bring to a boil until the alcohol evaporates. Add the water and pour on a generous amount of olive oil. Place the pan in the oven and roast for 10 minutes, until the fish is cooked. Remove from the oven, sprinkle basil leaves on top and serve immediately. “Wings,” in the parlance of cooks and fishermen, are the front fins on either side of a fish’s head. The flesh of the fish is more fatty in this area, so it has less tendency to dry out in cooking and is easier to remove from the bone (the bones here are mostly bigger). In terms of taste, we’re talking heaven. Last month, some wonderful local fish was available in the markets and restaurants, and some restaurants put “fried wings” on the menu. 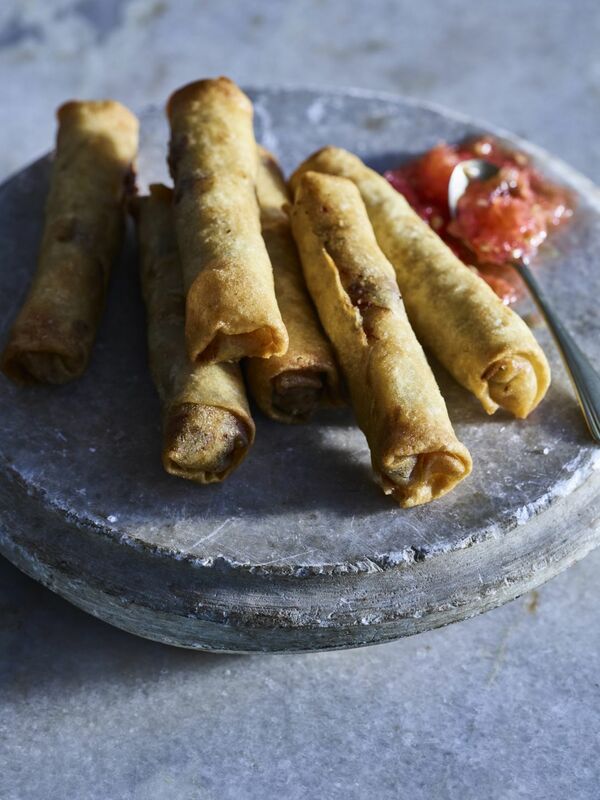 Preparing these stuffed cigars takes a little work, but the delicious warm cigars are totally addictive. Heat the oil in a pan for deep frying and fry the wings until brown. Remove the wings from the pot and place in a strainer until they cool a bit. Putting on rubber gloves, gently separate the flesh of the fish from the bones and skin, and place in a mixing bowl. Cut the scallions into 4-centimeter (1.5 inch) segments. Heat a skillet, pour in a little olive oil and sear the scallions for about 2 minutes, until soft. Remove from the skillet and add to the bowl with the fish. Heat a little olive oil in a skillet and fry the chopped onion until brown and caramelized, remove from the skillet and add to the bowl. Mix the contents of the bowl well, add the cumin, salt, pepper and olive oil and refrigerate. Prepare paste by mixing the flour and water. Fill the cigar leaves: Spread a cigar leaf on the work surface. Place a little bit of filling near the end closest to you and roll it up as you would when making stuffed grape leaves. Fold the edges of the leaf on the right and left over the mixture and start to roll from the bottom until you obtain a small, well-closed package with no holes. Spread some of the paste over the edges of the leaf to seal. The dip: Grate the tomatoes, transfer to a bowl, season with olive oil, salt and coarsely ground black pepper. Heat oil in a pan for deep frying, fry the cigars until golden brown and transfer to a platter lined with paper towels. Serve warm, with the tomato dip on the side. 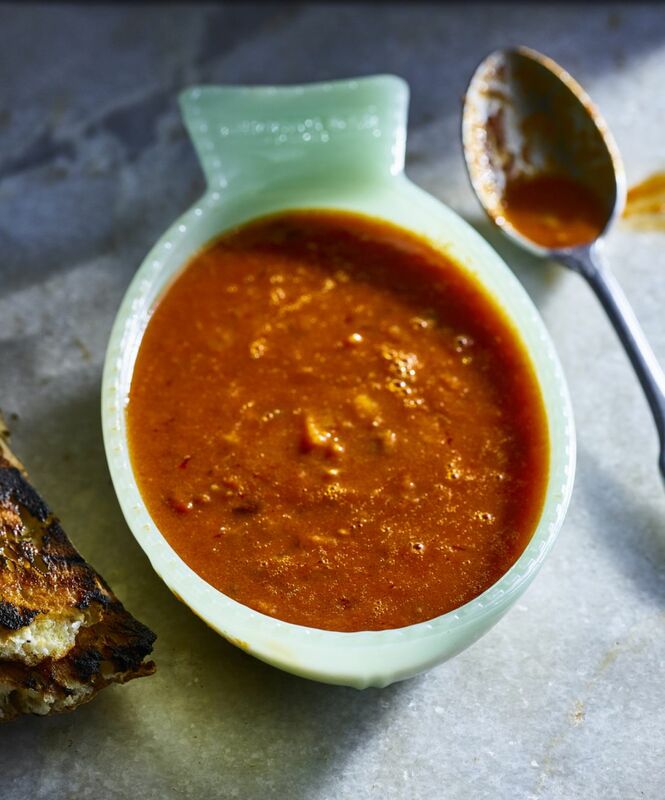 A marvelous thick soup that just calls out for great crusty bread to go with it. Soak the red mullet in ice water for 10 minutes. Coarsely chop 1 carrot, 1 onion, 1 leek and the 2 tomatoes. Drain the fish and cut into big pieces. Heat a little olive oil in a large pot and add the fish. Then add the chopped vegetables and tarragon, and fry together until the vegetables are seared. Add the white wine, let the alcohol evaporate and then add 1 liter water. Bring to a boil, lower the flame and cook at a gentle boil for 45 minutes. Use an immersion blender or food processor to crush the contents of the pot, then put through a fine sieve. Mash again and put through a fine sieve. Dice the onion, celery, leek and carrot into pieces of approximately equal size. Heat a little olive oil in a pot and fry the diced vegetables until golden. Add the strained fish stock to the pot, bring to a boil and then lower the flame. Simmer for 20 minutes over a very low flame. Add the grated tomatoes and simmer for 20 more minutes. Add salt and pepper to taste.